The term "English/British Golden Retriever" does not necessarily indicate an English origin. It refers to the standard by which the breed is judged. Many English Golden Retriever breeders state they breed English-type Goldens to eliminate confusion. The United States uses the American Kennel Club (AKC) as their standard but the rest of the world (outside of Canada) uses the British Kennel Club (KC) as their standard. The most obvious and eye-catching difference between the English/British Golden retriever and its American counterpart is the color of the coat. The English Golden Retriever is typically cream in color and the American Golden in much more red. Not all English Goldens are cream. Many very successful English Goldens have the same color coat as the American Golden. However, there are many more important differences to be taken into consideration. Topline & HindquartersAKC: Strong and level from withers to slightly sloping croup, whether standing or moving. Sloping backline, roach or sway back, flat or steep croup to be faulted. KC: Calls for level top line. Loin and legs strong and muscular, good second thighs, well bent stifles. Hocks well let down, straight when viewed from rear, neither turning in nor out. Amazingly these supposedly similar requirements give a different angulation in practice! This is very visible on these Champion pictures below. English Goldens have more level top line with legs more straight, American Golden Retrievers usually have slightly sloping top line with legs standing more out. Head- Broad in skull, slightly arched laterally and longitudinally without prominence of frontal bones (forehead) or occipital bones. Stop well defined but not abrupt. Foreface deep and wide, nearly as long as skull. Muzzle straight in profile, blending smooth and strongly into skull; when viewed in profile or from above, slightly deeper and wider at stop than at tip. No heaviness in flews. Removal of whiskers is permitted but not preferred. Eyes- friendly and intelligent in expression, medium large with dark, close-fitting rims, set well apart and reasonably deep in sockets. Color preferably dark brown; medium brown acceptable. Slant eyes and narrow, triangular eyes detract from correct expression and are to be faulted. Ears- rather short with front edge attached well behind and just above the eye and falling close to cheek. When pulled forward, tip of ear should just cover the eye. Low, hound-like ear set to be faulted. Neck- medium long, merging gradually into well laid back shoulders, giving sturdy, muscular appearance. No throatiness. KC: Head and Skull - Balanced and well chiselled, skull broad without coarseness; well set on neck, muzzle powerful, wide and deep. Length of foreface approximately equals length from well defined stop to occiput. Eyes - Dark brown, set well apart, dark rims. Ears - Moderate size, set on approximate level with eyes. Neck - Good length, clean and muscular. In both standards there is no clear indication how big the head must be in comparison to the rest of the body. 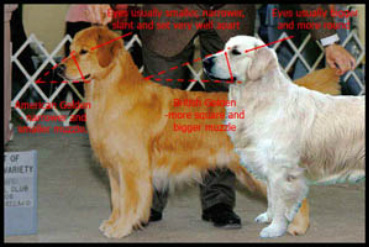 These different specs resulted somehow in a generally smaller head in American Goldens then in British Goldens. This is more visible for males then females usually. British standard calls for a clean and muscular neck. It is perfectly understandable that for holding bigger head a dog need more muscular neck. Still there is no mentioning about any grooming, clipping whisker trimming in KC standard. And that is one of the fundamental differences. KC Standard concentrates on description of ideal specimen. The basic function of dog titles is to make its progeny to spread. Trimming, clipping and other procedures are irrelevant if offspring of this specimen is concerned. In America the way of showing the dog is frequently more important than the dog itself. Another very characteristic difference is foreface and muzzle. AKC standard wants the muzzle to be straight but also states the foreface should be nearly the length of the skull. This resulted in smaller muzzle and more conical shape. Despite its more laconic form KC standard is more precise. It wants the length of foreface to be approximately length stop to occiput. English Goldens have definitely bigger and wider muzzles which influences stronger jaws. Head and Skull - Balanced and well chiselled, skull broad without coarseness; well set on neck, muzzle powerful, wide and deep. Length of foreface approximately equals length from well defined stop to occiput. Another very characteristic difference is fore face and muzzle. AKC standard wants the muzzle to be straight but also states the foreface should be nearly the length of the skull. This resulted in smaller muzzle and more conical shape. Despite its more laconic form KC standard is more precise. It wants the length of fore-face to be approximately length stop to occiput. English Goldens have definitely bigger and wider muzzles which influences stronger jaws. Eyes – Some American Goldens have their eyes very well apart usually while English type usually does not. Because US Golden Retrievers eyes are so well apart they tend to be slanted, narrow, triangular and detract from correct expression sometimes. In this their eyes are defying their own standard in contrast to the British Goldens (see pictures below). Ears and specifically their position are another point of difference between the two types of goldens. AKC wants ears well behind and above level of eyes. KC wants them at the level of eyes. This causes two very different looks. See pictures below. English-type Goldens are bigger-boned and shorter, with a more square head and or muzzle and are generally slightly heavier. The British Kennel Club standard calls for a level topline and straight hindquarters without the slight rear angulation found in American lines. The eyes of American line dogs tend to be set further apart than those of British lines and can appear to be slanted and triangular in shape by comparison. Cancer was the cause of death for 61.8% of American Goldens according to a 1998 health study conducted by the Golden Retriever Club of America, making it the breed's biggest killer (download PDF file of this study). The most common types of cancers in Goldens are hemangiosarcoma, followed by lymphosarcoma, mast cell tumor, and osteosarcoma. Although we cannot hang our hats on the results of just one study, it is interesting to note that In this particular study the incidence of cancer among English Cream Golden Retriever bloodlines was lower than in the American Golden Retriever bloodlines. In fact the British Kennel Club (KC) did a very extensive study recently and found that cancer only caused the death of 38.8% of English Goldens (download PDF file of this study). The median age of an English Golden is 12 years and 3 months according to the study, but the median age of an American Golden is only 10 years and 8 months. Characteristics of the Golden RetrieverTemperamentThe temperament of the Golden Retriever is a hallmark of the breed and is described in the standard as "kindly, friendly and confident." They are not "one man dogs" and are generally equally amiable with both strangers and those familiar to them. Their trusting, gentle disposition therefore makes them a poor guard dog. Any form of unprovoked aggression or hostility towards either people, dogs or other animals, whether in the show ring or community, is completely unacceptable in a Golden Retriever and is not in keeping with the character of the breed and as such is considered a serious fault. Nor should a Golden Retriever be unduly timid or nervous. The typical Golden Retriever is calm, naturally intelligent and biddable, with an exceptional eagerness to please. Whether the object is a thrown stick, tennis ball, or flying disc, retrieving can keep a dog of this breed occupied and entertained for hours, particularly if water is also involved. Goldens might also pick up and "retrieve" any object that is near to them upon their masters' arrival, all of this lending to their retriever name. Golden Retrievers are also noted for their intelligence, and can learn up to roughly 240 commands, words and phrases. The Golden Retriever ranks 4th in Stanley Coren's The Intelligence of Dogs, being one the the brightest dogs ranked by obedience command trainability. These dogs are also renowned for their patience with children. By the time they reach maturity however, Goldens will have become active and fun-loving animals with the exceptionally patient demeanor befitting a dog bred to sit quietly for hours in a hunting blind. Adult Golden Retrievers love to work, and have a keen ability to focus on a given task. They will seemingly work until collapse, so care should be taken to avoid overworking them. Other characteristics related to their hunting heritage are a size suited for scrambling in and out of boats and an inordinate love for water. Golden Retrievers are exceptionally trainable—due to their intelligence, athleticism and desire to please their handlers—and generally excel in obedience trials. In fact, the first AKC Obedience Trial Champion was a Golden Retriever. They are also very competitive in agility and other performance events. Harsh training methods are unnecessary - Golden Retrievers respond well to positive and upbeat training styles. Golden Retrievers are compatible with children and adults and are good with other dogs, cats and most livestock. Golden Retrievers are particularly valued for their high level of sociability towards people, calmness, and willingness to learn. Because of this, they are commonly used as guide dogs, mobility assistance dogs, and search and rescue dogs. They are friendly and tend to learn tricks easily. They are also known to become excellent surrogate mothers to different species. Kittens and even tiger cubs from zoos are well taken care of by golden retrievers. In some cases, a retriever may produce milk for its adopted even though it may not have been pregnant or nursing recently. Golden Retrievers are very active dogs, and require a reasonable amount of exercise each day, although exercise needs may vary depending on the individual dog and its age. They are a breed that is prone to obesity, and as such the average Golden Retriever should never be treated like a sedentary small dog. Some dogs may be too active to be easily exercised by elderly owners. They should be taken on walks daily. Goldens should be groomed at least once a week, and every day during heavy shedding. Their coats shed somewhat during the year, but are known to "blow coat" twice a year when they shed profusely. They also need to have their ears cleaned regularly, or otherwise an ear infection might occur. While shedding is unavoidable with Golden Retrievers, frequent brushing (daily to weekly) lessens the amount of hair shed by the animal. Severe shedding resulting in bald patches can be indicative of stress or sickness in a Golden Retriever. Golden Retrievers are very attached to their owners. They are highly social house dogs, seek to sleep in the same room as their owners, and should not be put into kennels for protracted periods. Leaving them alone in a room can cause the dog to become anxious and distressed. The dogs like to have something in their mouth and carry things around and should for this reason be provided with a copious supply of favorite toys — the particular obsession of which depends upon the individual animal. The Golden Retriever breed was originally developed in Scotland and England at "Guisachan" near Glen Affric, the highland estate of Sir Dudley Marjoribanks, later Baron Tweedmouth. For many years, there was controversy over which breeds were originally crossed. In 1952, the publication of Majoribanks' breeding records from 1835 to 1890 dispelled the myth concerning the purchase of a whole troupe of Russian sheepdogs from a visiting circus. Improvements in guns during the 1800s resulted in more fowl being downed during hunts at greater distances and over increasingly difficult terrain. This led to more birds being lost in the field. Because of this improvement in firearms, a need for a specialist retriever arose as training setter and pointer breeds in retrieval was found to be ineffective. Thus work began on the breeding of the Golden Retriever to fill this role. Some Goldens excel at retrieving in water; others only wade up to their bellies. The original cross was of a yellow-colored Retriever, Nous, with a Tweed Water Spaniel female dog, Belle. The Tweed Water Spaniel is now extinct but was then common in the border country. Majoribanks had purchased Nous in 1865 from an unregistered litter of otherwise black wavy-coated retriever pups. In 1868, this cross produced a litter that included four pups; these four became the basis of a breeding program which included the Irish Setter, the sandy-colored Bloodhound, the St. John's Water Dog of Newfoundland, and two more wavy-coated black Retrievers. The bloodline was also inbred and selected for trueness to Majoribanks' idea of the ultimate hunting dog. His vision included a more vigorous and powerful dog than previous retrievers, one that would still be gentle and trainable. Russian sheepdogs are not mentioned in these records, nor are any other working dog breeds. The ancestry of the Golden Retriever is all sporting dogs, in line with Majoribanks' goals. Golden Retrievers were first accepted for registration by the The Kennel Club (KC) of England in 1903, as Flat Coats - Golden. They were first exhibited in 1908, and in 1911 were recognized as a breed described as Retriever (Golden and Yellow). In 1913, the Golden Retriever Club was founded. The breed name was officially changed to Golden Retriever in 1920. The median life span for Golden Retrievers is approximately 10 to 12 years. They do very well in small living areas of at least 500 sf. While the breed is recognized for its vitality, many retrievers are susceptible to specific ailments. A responsible breeder will proactively minimize the risk of illness by having the health of dogs in breeding pairs professionally assessed and selected on the basis of complementary traits. Golden Retrievers can be profitable for puppy mills and backyard breeders. As a result of careless breeding for profit, Goldens are prone to genetic disorders and other diseases. Hip dysplasia is very common in the breed; when buying a puppy in the US the parents should be examined for hip disease by the BVA (British Veterinary Association), PennHip, OVC (Ontario Veterinarian College), FCI or OFA. It is also important that you choose a breeder who has tested for OFA clearances on the elbows, eyes and heart of their breeding dogs.